Gwynfa is a fully equipped self catering cottage located on the banks of the River Colwyn, in the picturesque, award winning village of Beddgelert. The cottage makes an ideal base for a relaxing or active holiday as its setting provides easy access to paths up Snowdon, yet it is only 8 miles from the coast and a mile from Beddgelert Forest. You can walk, bike ride, horse ride, climb, canoe, sail, play golf, fish or just relax. The historic harbour towns of Caernarfon and Porthmadog are close by and are linked by the Welsh Highland Steam Railway which stops at a station in the village, you can take ride through the dramatic scenery of the Snowdonia National Park, with children travelling free. The village of Beddgelert has a number of pubs that serve food - some of them are dog friendly - cafes, tea rooms and shops offering local crafts and produce. It also has an award winning Ice Cream Parlour. Amongst the other amenities are a post office and well stocked general store. I live on the side of Moel Hebog overlooking the village of Beddgelert along with my dog Joe. I moved here from Manchester 10 years ago and have never looked back. We enjoy everything the area has to offer, from forest and lakeside walks to strolls on the nearby beach. Although I live slightly away from the village I enjoy all the amenities there and when Gwynfa went up for sale I saw the potential to extend it and make it into a home. I decided to let it out until I am ready to move into myself. Gwynfa is close to all the village amenities, has it's own private patio overlooking the river towards Meol Hebog and boasts an off road parking space. The downstairs bathroom has an electric shower, basin and wc. The upstairs bathroom has a separate electric shower, corner bath basin and wc. Shower gel, hand soap and toilet rolls are all provided. The lounge has comfy leather seating and a log burning stove. There is a 39" flat screen TV with free sat and a DVD player. There is a large selection of music CD's and films along with board games such as monopoly and playing cards. The fully equipped kitchen has a gas hob, electric oven with extractor fan, fridge/freezer, washer/dryer, dishwasher ,microwave, kettle and taster. A full compliment of crockery, cutlery, pots and pans are provided along with tea towels. There are a few novels available. A selection of music CD 's are provided. A selection of videos are provided. There is a patio area with table and chairs for 6 people. It is by the river and looks towards Moel Hebog. There is a golf course just outside in the nearby town of Porthmadog. Outside: The private patio has a table and six chairs, it has a gas BBQ with gas provided. The view looks over the river Colwyn towards Moel Hebog. Cleaning / Towels / Linen / Maid service: Bedlinen, towels (including tea towels) and electricity are all included. Gwynfa is thoroughly cleaned between each occupant and linen professionally laundered. For stays over one week the linen and towels are changed each week. Lyn was the perfect host. She was there to meet us. The cottage is very well equipped and she ensured that all the necessities of bed linen, towels and even food , is there to start a holiday without delay or any worries. The cottage is in a great location in the centre of the village and backing on to the beautiful river. We were stupid enough to leave our home keys behind when we left and Lyn made sure they were sent back to us asap. Great service. You can but love this place. Had a wonderful weekend in Beddgelert, the cottage was immaculate, beautifully decorated and really well equipped, had everything we needed! The hosts were really friendly and helpful throughout the booking and stay, we even made friends with the lovely next door neighbour! Beddgelert is a beautiful little place with some lovely pubs and places to eat, highly recommended Hebog for Sunday lunch, will definitely return! Lovely position to walk into Beddgelert. The house was lovely and clean. Everything there you could want. Will return. We had a fantastic time, yet again, at Gwynfa. 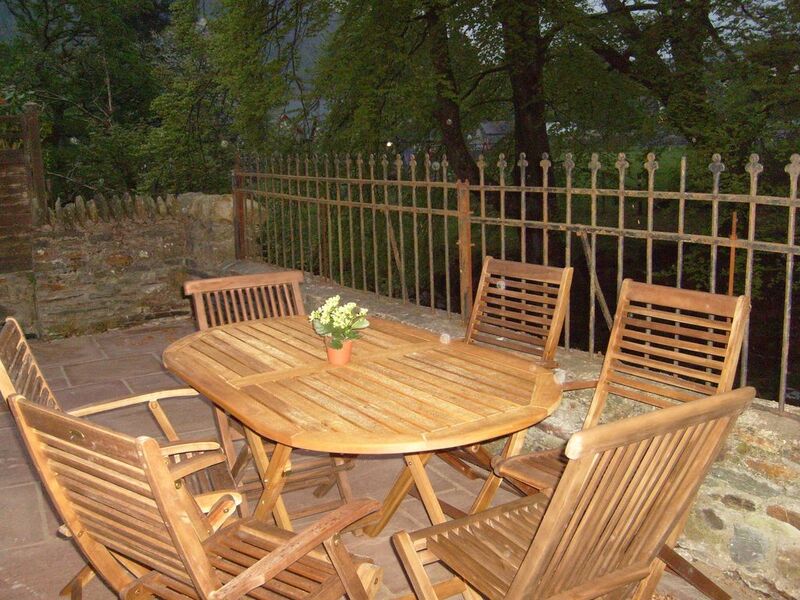 The cottage is beautiful, comfortable and so well equipped- ideal for our needs. Having supper on the patio overlooking the river was peaceful and a delight. The location is excellent for exploring all the area round about - Snowdon, Llanberis, Betwys y coed, Capel Curig. It was lovely to come back each evening to rest and recuperate. Lynn was very welcoming and helpful on arrival. The cottage was very well equipped and we had everything that we needed. Appreciated the little touches - all the things that are annoyingly absent in some holiday accommodation were in place - kitchen roll, washing up sponges etc, tea towels, good selection of pans, hairdryers, soap, toilet rolls. Even a pint of milk for that allimportant cup of tea on arrival! Good location. Comfortable. A great place to stay. Thank you for your great review and I'm so pleased you found everything you needed. Having spent most of my holidays in self-catering I have tried to make sure that Gwynfa has all those things that I would want if I were staying. Maybe see you again at some point in the future. I stayed 3 nights in Gwynfa with my family to celebrate my birthday. The cottage was everything I had hoped it would be. It’s in a great location with a terrace overlooking the River Glaslyn. It was much bigger than it looks from the outside with plenty of room for 6 people. It’s well equipped and spotlessly clean. Lynn met us on arrival and made us feel very welcome. There were storecupbard basics in the kitchen and fresh milk in the fridge. There were also doggy treats provided for our springer. Lynn’s attention to detail is excellent, I would have no hesitation in recommending this cottage to anyone and would love to return. Borth y Gest beach is 9 miles away, you can walk along the coast to Criccieth or walk down onto a number of sandy beaches. Just half a mile further is Morfa Bychan where you will find the long sandy beach of Black Rock with the sand dunes providing places for children to explore. The Welsh Highland Railway - Steam train that goes from Porthmadog to Caernarfon stops in the village and is 10 minutes walk. Please note there is no ATM in the village. With certain banks, you can use your card at The Post Office. The nearest supermarket is Tesco at Porthmadog. There is a large 24 hour Tesco, 20 miles away in Bangor.